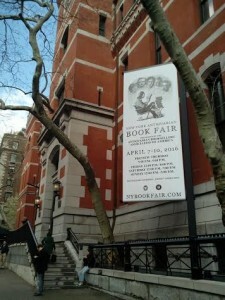 Every April the ABAA (Antiquarian Booksellers’ Association of America) and the ILAB (International League of Antiquarian Booksellers) sponsors an international antiquarian book fair in New York, at the Park Ave Armory. The other big fairs of the year are in Boston (November) and California (February), alternating years in Los Angeles & San Francisco. 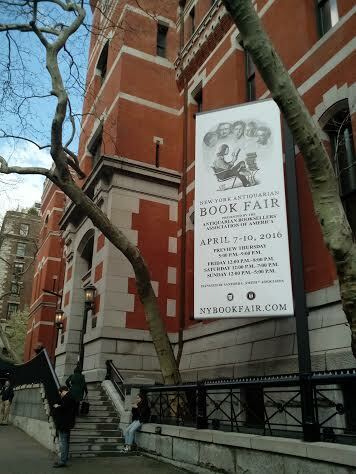 I always come to New York, but this may be the last year that the show is at the Armory, which would be a great shame (they are planning to go up-market and attract folks that can pay a lot more than book dealers to use the space). I usually just come for a day, but this trip I was able to stay for 3 days, and so, I thought a report might be fun. Some 200 dealers from all over the world place the most interesting items in their stock in booths that measure about 10 x 10 feet … tens of millions of dollars worth of antiquarian material in one big room for four days. It’s a great place to build relationships and buy amazing things for your collection. The dealers hail from many US states as well as the U.K., Germany, France, the Netherlands, Italy, Spain, Belgium, Switzerland, Denmark, Hungary, Austria, the Czech Republic, Russia, Japan, Australia and Argentina. There are a cluster of dealers from the UK from whom I love to buy–they have an eye that I agree with, and generally I agree with their pricing! This year was no different, and I will discuss specific acquisitions in later posts. Justin Croft, whom I met perhaps 10 years ago when I was buying for another institution, always has more than enough items to tempt–especially French and English manuscript material. Simon Beattie is another whom I met a decade or more ago, when he was with Quaritch, I think, and I was so impressed when he set up on his own–both because I know how brave that move is (I tried my hand at bookselling for a couple of years), and because his catalogues were just so freaking cool. The design actually made the items more attractive–one wanted to buy them just to reward Simon for the effort! And although I generally don’t acquire Russian materials (one of his specialties), he often has a quirky rare item that fits with what I am looking for at the time (more to follow!). Susanne Shulz-Falster and Deborah Coltham are two other U.K. dealers with whom I enjoy working. Always charming and enthusiastic (as are Simon and Justin), Susanne has fabulous books related to printing history, but it is often the quirky side items that attract me (again, more to follow). Deborah often comes up with great stuff on the history of medicine (including quackery). That’s enough for now–back to the fair!